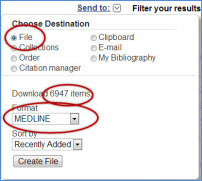 Click on Create File, name it (the filename will end with .nbib), and save it to the desktop OR follow your browser's prompt to open the file, and choose EndNote. (This step may differ based which browser you use and how it is set to handle downloads.). 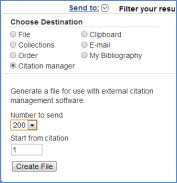 If you open this file, your computer may automatically recognize it as an EndNote file from PubMed and import it. If not, go to step C, below. Go to step C, below. Click Choose File (next to the Import Data file box) to browse to the .nbib file (if using method A) or .txt file (if using method B) that was created from your PubMed search. The references will go into the Imported References group.